I had no idea that potty training was such a big deal! Thank you to all who have given advice, ideas, prayer, and encouragement since I recently mentioned our first attempt at potty training Lydia. Here’s the full report on how the week went. The method we decided to use involved letting Lydia go diaper-free all day for three days. Because of the current setup of our home, this required Lydia and I to stay in the bathroom all day, whenever she was awake. After breakfast we headed to the bathroom and brought the laptop with us. To pass the time we would listen to Adventures in Odyssey, watch my sisters latest vlog posts, and click through Swagbucks videos (Swagbucks is a topic for a whole different post, but if in the meantime you happen to decide you want to join, please feel free to put me down as a referral). The day wasn’t as long or difficult as I had been dreading, but it wasn’t as successful as I had hoped. Lydia either doesn’t go to the bathroom very often or she was holding it in. She had about four accidents all day. Each time I would quickly put her on the potty and explain that we go in the potty. By the end she was saying “woops” if she had an accident and even said “Potty!” once right before she had another accident later. For lunchtime, naptime, and once Dan got home, I put a diaper on Lydia and she promptly went in the diaper, like she had been saving it up all along. Tuesday morning was similar to Monday, but the time passed more slowly. Much to my dismay, Lydia had her first accident while I briefly stepped out of the bathroom to bring her some watermelon. Later, she had her first real success, but she had been asking to sit on the toilet for so long, I’m not sure she really realized when she actually had to “go”. 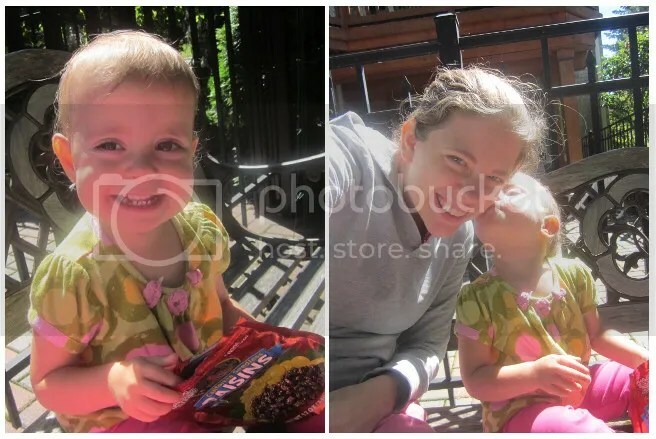 Nevertheless, we celebrated with a short break outside and some raisins, which Lydia absolutely loves. Lydia stayed in the bathroom for lunch and ate while sitting on the toilet. She went in the toilet again, but she had been sitting there for a while and I’m not sure she was actually learning anything. She filled her diaper at naptime. When Dan came home we decided to continue the training by just putting pants on Lydia without a diaper. She wet herself during dinner but obviously was unbothered because she had no reaction whatsoever and sat there until she was done eating and we cleaned her up. Tuesday night was my breakdown. I didn’t see any progress, was questioning if I was doing it “right” or just confusing Lydia by putting the diapers on her occasionally. I was bored in the bathroom and not looking forward to another whole day of the same. Wednesday actually seemed like Lydia was making a little progress. She would say potty throughout the day, sometimes right before she went and sometimes when she didn’t appear to need to go at all. She was walking around like she had to go for long periods of time and I suspect she was just holding it in. This day she started crying when I put her on the potty and kept asking for me to put a diaper on her. We were both unhappy by the time Dan got home. Wednesday night we had Bible study so it was on with the diaper for the rest of the night and Lydia seemed very pleased. While we’re not declaring our three-day attempt a complete failure, it also wasn’t all we had hoped. We suspect Lydia is (at least developmentally) too young to recognize very far ahead of time when she needs to go. However, we don’t want to confuse her by completely throwing in the towel. So lately I have been asking her throughout the day if she needs to go potty and then sometimes I put her on the potty regardless of her answer. I have heard from a lot of moms already, but what do you think? I guess I’m not exactly looking for criticism on what we have already done (I’m sure there were lots of points where we did it “wrong” and could have done a lot better), but rather some ideas about what to do next. We’re really ok if Lydia doesn’t potty train for many more months, but don’t want to confuse her by just going back to diapers and forgetting the potty altogether. This entry was posted in Lydia Hope and tagged Bathroom, Children, Diaper, Lydia, Toilet training by justeeni. Bookmark the permalink. Nice try, even though it didn’t work. 🙂 Obviously, any suggestions I have for potty training are only things I’ve heard and think sound like they would work, as we haven’t really done any potty training of our own yet. 🙂 Colten says “uh oh” if he goes potty without a diaper and NOT in the toilet (like in his pants or on the ground outside, where I occasionally let him go diaperless (with his little potty nearby)), but he doesn’t seem to realize the signs and signals of a full bladder yet. Thanks, I think Lydia’s in the same boat. She can say “woops” when she has an accident without a diaper, but otherwise just doesn’t seem to notice. Potty training is certainly a trying time of patience, I assume that you and Dan are already doing this but I definitely don’t think my 2 1/2 yr old would be potty trained without some serious prayer! I have a strong willed 2 1/2 year old and I asked my Bible study group and Sunday School class to join me in praying for this time in our life. Jesus cares about the little things too. I was actually specific in my request to God. It was in the middle of May when I asked my prayer warriors to offer my request up to God. As I am expecting Baby #4 in August, I was asking God that Benjamin be potty trained by the middle of June. I know Gods ways are better than our own, so if it did not happen by then, then I would still trust God in this situation but ALL glory to God, Benjamin was wearing underwear full time with in 2weeks. (Note: we do have accidents here and there, those are to be expected, but overall- he is doing great!) I probably did a lot of things that a lot of people would think I am crazy for but it worked for us. When he was in diapers, I noticed that he would either poop under the dining room table or behind the couch around the same time in the morning everyday. So I put a potty chair behind the couch around that time and walk away for his privacy and he would go. So after 3days of that, I moved the potty back to the bathroom. And he would do it there. He refused to use the big potty for pee for a month then he changed to the big potty and refuses to use the training potty. Before it got to that point though, we would take the potty outside as he wore underwear and would pretty much put him on the potty every 15 minutes (whether we were inside or out) Sometimes he would go and sometimes not. Now I am doing a little more with my 15month old. Yesterday, we had a really good day. She went pee 3x and poop once. Using 3cloth diapers throughout the day. Today, not so much! We did a lot of running around so I wasn’t able to put her on the potty. I also did something a little different than the average person, I did elimination communication consistently with my 3 1/2 year old and he has been going poop on the potty regularly since 9months old. If interested, look it up. It’s popular in the European countries. Reuben was pretty much potty trained at 2years old as well. I used this method with the other two as well but was not as consistent as I had other kids wanting my attention. I will pray for you Justine! 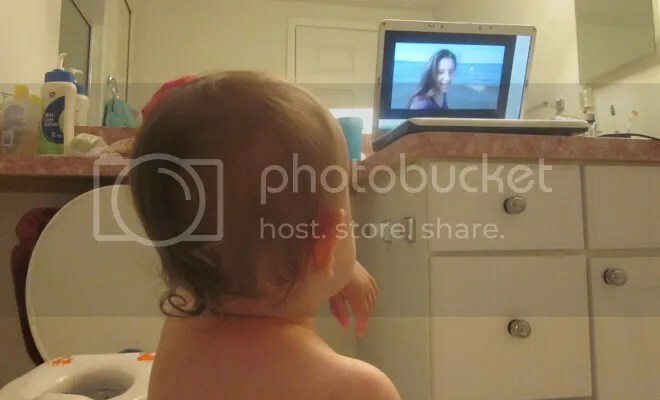 Hang in there and don’t give up, when you have her on the potty, sing to her, read a book, I even allowed the kids to watch tv: ipad bc we didnt have tv til just a few weeks ago. (usually educational-just my preference) Don’t be hard on yourself, I have a tendency to do that bout myself sometimes. Ask our Father to help you through this as He cares about what we do. Love and miss ya! Miss those crazy kitchen days at LABC too!!! Thanks Stephanie, for sharing your own story and for your encouragement! I’m starting to get it that there’s no “right way”. If it works, it’s right. 🙂 Congratulations on your beautiful growing family! What a blessing those kiddos must be to you. Missin’ those kitchen days during the summer too. Two thoughts, Justine…First, we used a similar method in training Rachal. She was not “trained” in the timely manner that was suggested, but it gave her a great start. Second, Leah turned two, four months before Rachal was born. I had hopes that she would be trained before Rachal came along. She wasn’t. As Rachal’s due date approached we stopped training. After we all adjusted to a new baby, we began training again and were successful. Trust the Lord to guide you.